"Hello, my name is Hishgee and I am the undergraduate student of Electrical and Electronic information engineering department. I transferred to TUT in April of this year and since then I am living in TUT Global House, which was newly built in 2017. 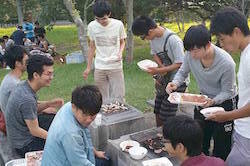 Last month we had a great barbecue party at our school. As a Mongolian student which means meat lover, it was a great event for me. The food and drinks were so good. Also, we had a great chance to talk and communicate each other not only students, but also the teachers, housemaster, and staff from the international affairs division. Because during the school days we are so busy that getting close to each other was difficult. I have got known a lot of people's names and made new friends. 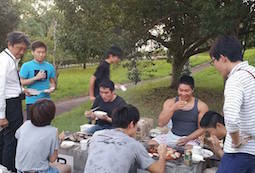 My impression is, this kind of events were so needed and doing a barbecue in summertime was a great idea!"